A recent report from the United Nations’ Intergovernmental Panel on Climate Change found that if greenhouse gas emissions continue at the current rate, the atmosphere will warm up by as much as 2.7 degrees above preindustrial levels by 2040. Fortunately, many companies that generate huge amounts of electricity, including data centers, have pledged to switch to renewable energy. This is great news, since it is estimated that by 2030, data center demand will increase up to 10 times its current levels, equaling 13 percent of global electricity consumption. More good news: Solar power electricity generation pricing is the cheapest electricity you can get every single day at 12 noon in many places across the United States. Much of that price drop is driven by more efficient solar modules, cheaper and smarter inverters, as well increased levels of productivity. Some of the largest users of data centers are companies you have probably used at least once this week or perhaps in the last few hours, such as Amazon, Google, Uber and Facebook. Our expectations for instant gratification have led to surging demand for centers from companies in two data-intensive sectors – connected cars and the peer-to-peer “sharing economy.” The brains of these companies are in “the cloud,” which are not water and air, but buildings, machinery, and people who construct and manage it all. Google has data centers in 21 states. Facebook has nearly 15 million square feet of data center space completed or under construction, with several million more feet in the planning stages. Uber provides 15 million trips a day in 600 cities in 78 countries around the world, making the company a major user of data center infrastructure. Electricity is the fuel that runs these data centers. Power use at data centers in the United States has grown at about a 4 percent rate annually since 2010 and is expected to hit 73 billion kilowatt hours by 2020, more than 1.8 percent of the country’s total electricity use, according to the Energy Department’s U.S. Data Center Energy Usage Report. These centers contribute about 2 percent of the world’s greenhouse gas emissions. Major data center operators say slashing their CO2 emissions is a primary goal. Data Center Frontier reported that renewable energy has become a key component of Facebook’s data center projects. Gov. 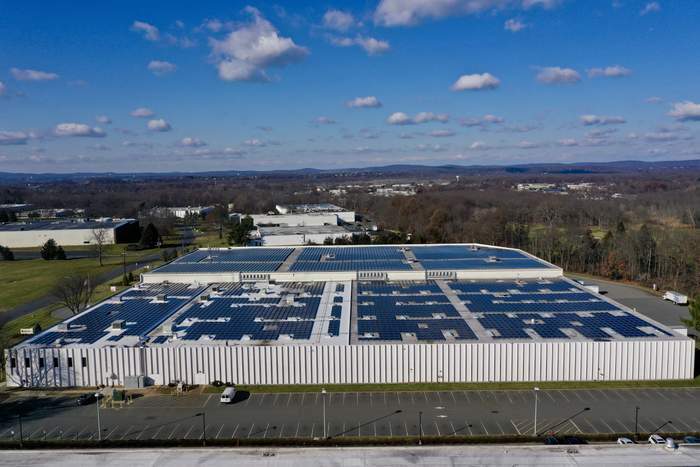 Phil Murphy of New Jersey recently unveiled more than 12,000 rooftop solar panels at the Edison Amazon Fulfillment Center. Amazon’s rooftop installation in Edison is one of 19 the company has in North America, with a goal of 50 installations worldwide by 2020. Google is the world’s largest corporate buyer of renewable energy. There are measurable financial and environmental benefits for businesses that transition to solar power. By 2050, it’s expected that wind and solar will produce half of the world’s electricity. Partly, this is due to lower prices, with solar panel installation costs dropping by more than 70 percent over the last eight years. Additional major factors are breakthroughs in the efficiency of solar panels, better energy storage technologies and stronger awareness of traditional energy’s environmental impact. 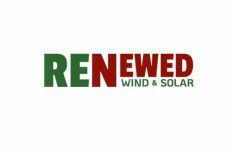 Renewable energy costs are stable because there is virtually no recurring cost. Solar can save companies hundreds of thousands (if not millions) of dollars and has a return on investment of just 3-5 years. Many states offer solar rebate programs. For example, New Jersey provides Solar Renewable Energy Credits, allowing businesses to sell excess energy to electric generators. NY, and more recently MA, on the other hand, directly compensate system owners based on system size. Data center owners are also eligible for Federal income tax credits, and accelerated (year 1) system depreciation. When added up, these incentives can be used to cover 45%-80% of the overall cost. Data centers meet the key criteria for solar. Many data centers operate 24/7, leading to high energy bills. They also usually take up a large footprint, which means plenty of roof space for solar panel installation. Solar panels won’t disrupt the operation of the facility, since panels are installed in underutilized space, whether that’s on the roof of the property, or other open space such as a parking lot or field. A solar system also increases the life of the roof, and the value of the property. There’s no doubt that the installation of solar panels is a major project. That’s why many companies retain a solar energy broker to help save on solar panel prices and maximize the incentives. They take on the heavy lifting of getting through the transition to solar energy, including the initial site visit, financing and all phases of installation. Commercial solar panel installation proves to tenants that you’re investing in the future of the property and care about the environment. By adding a solar system to the building, data centers are more likely to produce higher rents and/or lower vacancy, according to the Department of Energy. Commercial solar systems increase the value of the building and cuts down operating costs. Helping to push businesses into the world of sustainability, New Jersey and New York’s governors have mandated that 50 percent of all electricity consumed come from renewable energy sources by 2030. Since 2011, solar in New York State has increased more than 1,000 percent. In 2018, through June, New York was ranked third nationally in residential and non-residential solar installed. Governor Cuomo established NY-Sun, a $1 billion initiative to advance the scale-up of solar and move the State closer to having a sustainable, self-sufficient solar industry. New Jersey places sixth on the Solar Energy Industry Association’s list, with solar prices falling 47% in the last year. One thing we can count on is that the sun will continue to shine. Once you install a commercial solar system, it will keep producing power, dramatically reducing or even eliminating energy bills and working towards reducing carbon emissions. Yaniv Kalish is the CEO of SolarKal, a commercial solar advisor, that helps companies navigate the transition to solar, from the first site visit to the final installation.